Miami. The great city of sunny beaches and parties. Endless shoreline lined with palm trees is enough to leave everyone indifferent. We all wish to live in a place of constant warm weather. A place where you never talk about the weather because it never changes. It is always 30 degrees and sunny. In this city of indoor culture, it is important to have a nice house or apartment in a nice neighborhood. Especially if you are moving to Miami from another country. You need to find a neighborhood that will accommodate your new American lifestyle with a slowly rising curve when it comes to adaptability. This is the essence of this article. What are the best Miami neighborhoods for expats? Read on and you will find out! Most of you are probably aware of the meaning of the word, but it is better to make it clear at the beginning. “An expatriate (often shortened to expat) is a person temporarily or permanently residing in a country other than their native country.” (Wikipedia) This is mostly done due to better business opportunities, and a better lifestyle. It is different from an immigrant, because, immigrants are exclusively permanent dwellers in the new country, while expats may return to their home country, due to their dual citizenship. If you are a well-situated expat, you should consider one of these neighborhoods as they are the financial quarter of the city. However, you still may end up on the waiting list, because of the high demand for accommodation in these areas. South Beach is one of those neighborhoods that come to mind when you think about Miami. Long, sunny beaches, lots of lively people going about their lives, and a lot of parties, clubs, and malls. The neighborhood has some of the best Art Deco style buildings and will impress anyone who gazes upon them. However, the area is often crowded and there are a low amount of houses. It is mostly apartments and condos. So, if you want a big, comfortable house, this is not the neighborhood for you. The public traffic network is very well developed, so many people just choose not to even buy a car. If you want a fast lifestyle full of fun and parties, by all means, move to this neighborhood. This is the “Manhattan” part of Miami. The financial center of the city. People feel this because of the very urban lifestyle and tall skyscrapers. If you want to pursue a career in finance and economy, this is the neighborhood for you. This neighborhood offers a lot to expats because of its cosmopolitan feel. Living close to your office is a thing everyone should consider. Other than that, you will have a great view of the Biscayne Bay where you can do recreational activities. Filled with the best boutiques and restaurants, this will accommodate all those who want a luxurious lifestyle. However, that kind of lifestyle is not cheap. The average rent in Brickell is $2.275, making it the most expensive neighborhood in Miami. If you have a family, it is important to live in a neighborhood with big family houses, and good schools. By doing this you will ensure a good upbringing for your children which is of the utmost importance. Here are some of the neighborhoods which are the best for a family life. Coconut Grove is one of those relaxed family neighborhoods, but still not void of the rush of a city life. Home to hippies and drifters during the 1960s, the area has developed into a neighborhood filled with modern homes. It is one of the most historic neighborhoods in Miami, other than Coral Gables. The area is filled with parks and bike trails and it is fully walkable. You should not need a car or a bus to get to anywhere within the neighborhood. The people within the neighborhood are a mix of young families and senior citizens. The rent price is $1,611 which is about the same as the city average. The neighborhood also features the Coconut Grove Playhouse, one of Miami’s best-known theaters. Get used to this, when you move to Miami, dreams become reality! Another neighborhood filled with parks and good schools are the Coral Gables. There are a lot of houses here, many which qualify as estates, but smaller, cheaper houses can be found as well. It also has a lot of Spanish influences in an architecture similar to Coconut Grove. There are also condos available if you opt for that. This is the home of the University of Miami, which is a great feature when you consider your child’s education. Other than that there are many parks filled with canals, and people usually refer to this part of the city as City Beautiful. 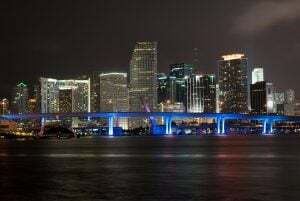 The average rent in this neighborhood is $2,066, which is one of the most expensive neighborhoods in Miami, but if you are well-situated, it is one of the best areas to start a new life with your children. This neighborhood is deemed by many, as the best neighborhood for families with kids. A very big park system with a lot of good private and public schools will leave no one indifferent. Pinecrest Gardens is the crown jewel of the whole park system featuring over 1,000 varieties of exotic tropical plants and trees. The average rent in Pinecrest is $1,698, which is a little bit more than the city average. Miami is a great city when it comes to moving as an expat. It offers a lot of business and education possibilities. If you are moving to Florida, Miami is probably your best bet. The biggest city in the state, with constant warm weather, long sunny beaches, and huge skyscrapers gracing the skyline. A life of opportunity awaits, you just have to seize it. 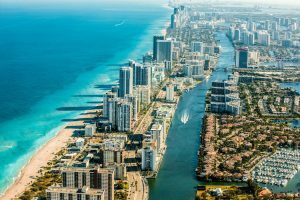 Hopefully, this article was helpful in deciding the best Miami neighborhoods for expats. Good luck with your move! Huge skyscrapers grazing the skyline!